Since 2009 Octopus Telecom provides its services successfully on the territory of Great Britain. We place safe equipment to connect to ultra high-speed home Internet to all those who want it! The connection time for a new client depends on the address of the connection and access to a free line of land telecommunications. Usually it is 1-4 weeks. We offer free consults about a pre-term termination of the agreement with your current operator, and ready to explain any technical details. With our company, you will not only receive high quality connection but an individual approach as well! To a modern person, home Internet has the same value as electricity or water supply. So if you plan to have an Internet connection at home it is necessary to choose a good Internet-provider. You can do that based on the quality of the services, price and level of technical support. Octopus Telecom has been working at the Internet services market since 2009, and the company has recommended itself as a trustful provider with a client-oriented policy. We offer cheap high-speed Internet, we use only approved equipment and ensure qualified support. By choosing us you will get the best home Internet. Wireless Internet is a handy alternative to cables providing the users with a possibility to connect mobile and tablet computers to the home network immediately. Setting up a WiFi router allows to ensure stable Internet access anywhere around the house including nearby floors and remote premises. See for yourself the convenience of the wireless Internet by setting it up a powerful WiFi router “Octopus” which will ensure high-speed data transmission in a private house or an apartment. Applying for a broadband Internet for 12 months you will not even have to pay for the wireless equipment. You will get it absolutely free of charge on the terms of lease. Want to use unlimited Internet at a low cost and watch your favourite TV programmes in HD quality? In this case you will like our tariff “Home Internet and Television”. A wide package of services include unlimited broadband Internet with speed up to 24 Mbps as well as 24-hour access to over 200 popular television channels. Chat in social networks, watch the best films and TV programmes, listen to the music online, use file storages and cloud services. Live your life fully without limitations. Tariff “Home Internet and Television” will be your gateway to the world of multimedia entertainment. If you are not used to compromise and like to live your life at high speed then our premium tariff “Fast Internet, Telephone and Television” is for you! Get maximum options at a moderate price. Ultra high-speed Internet will allow you to download even bulky files in seconds. Digital television will provide you with access to hundreds of interesting channels and a huge film library. Modern IP-telephony will remove all conversation time limits, even if you make international calls. With our tariff “Fast Internet, Telephone and Television” the future will come sooner than you think. Octopus Telecom fast connection of home Internet in any region of England using the safest equipment. You will not have to get absorbed into technical nuances of the connection as everything related to the telecommunication infrastructure is our care. Our trained specialists will perform all of the necessary cabling, mounting, connection and equipment configuration works. If you have any questions of problems you can always call our 24-hour technical support line. Our polite and qualified employees will help to resolve fast any kind of problem and will answer thoroughly all your questions. HIGH QUALITY OF EQUIPMENT AND SERVICES! When opening options of International telephony for a client we use safe and high-quality equipment from the best manufacturers only. An N-series WiFi point and a router (4LAN) are integrated into a ADSL 2/2+ modem. 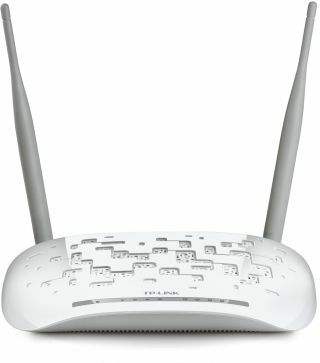 The device maintains working in the high-speed standard 802.11n regime (that ensures speed up to 300 Mbps). Possible to connect almost any modern device with Wi-Fi (IEEE 802.11b, IEEE 802.11n and IEEE 802.11g standards). Setting is performed with the Easy Setup Assistant – master that supports all popular languages. Presence of inter-networking NAT and SPI screens ensure safe protection against possible Internet-attacks. Fast setting of a new safe connection in the WPA regime is performed automatically by pressing the QSS button.